Ontario and the City of Brampton jointly opened a $90,000 Level 2 charging station that has the capacity to charge four vehicles. Ontario fired up the first solar-powered electric vehicle charging station in the Greater Toronto Area this week, but the province remains well short of the 485 public EV chargers it had pledged to install by the end of March. It brings the total number of charging stations in Brampton to 33 at 10 locations. At the end of March, the province said two thirds of the province’s $20-million network of 485 chargers were in service. After the Brampton station came online, the Ministry of Transportation would only say in a statement that “over 50 per cent of the network is in service.” The province hasn’t said how many new stations have come online since March 31, the date by which all were supposed to be in operation. The idea behind the network is to eliminate range anxiety and encourage the sale of more green cars in Ontario. The province had 9,179 electric vehicles on the road at the end of 2016, according to data compiled by FleetCarma, a Waterloo-based fleet management company that supports EV adoption. A Ministry of Transportation spokesman said the province still plans to have about 200 Level 3 and nearly 300 Level 2 charging stations installed across Ontario at approximately 250 locations by fall, nearly five months behind schedule. The Brampton chargers are located at a soccer complex. 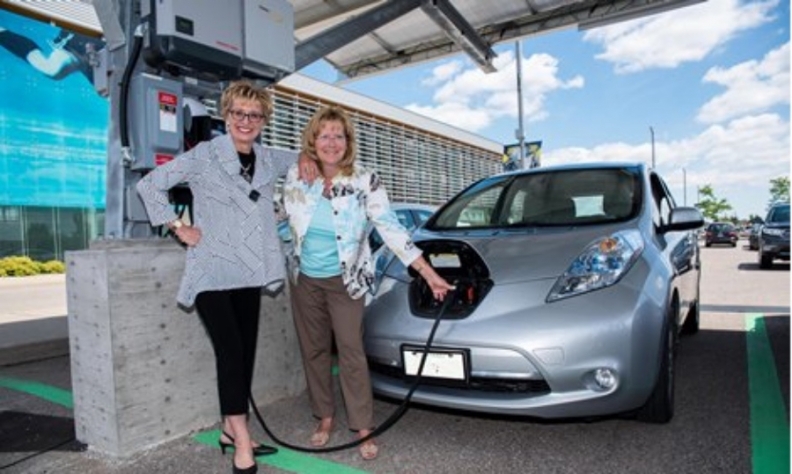 Ontario is creating a network of EV charging stations in cities, along highways, and at workplaces and other public places across the province. Premier Kathleen Wynne committed to building the charging network when she was at the 2015 climate change talks in Paris.